Humanity is at an inflection point. Climate change, population growth, security, and inequality are among the most critical challenges of our time. How will the world support the one and a half billion people predicted to be added to the global population by 2050 when we already exceed the sustainable limits of our planet? We are placing ever-increasing burdens on our resources and ecosystems. At the same time, technology is transforming the way we live and work in very positive ways—with extraordinary potential to address the needs of both businesses and society with greater efficiency and sustainability. A world where everything computes holds great promise to advance humanity on every front. I am privileged to head a leading technology company at such an important and exciting time. The pace of innovation in IT is the brightest hope for solving the world’s most pressing sustainability challenges for generations to come. The world’s systems of manufacturing, energy production, farming, and healthcare are on the brink of an efficiency revolution—powered by connectivity and data. We are partnering with our customers across multiple industries to transform their businesses with hybrid IT and intelligent edge solutions that are redefining efficiency and accelerating time to value. And as the industry leader in energy-efficient high-performance computing, we are empowering our customers to solve the world’s most challenging and complex problems—from food security to healthcare delivery. Although the IT industry holds incredible promise for driving sustainability in the operations of our clients, we must be always vigilant that the same focus on sustainability serves as a North Star for our own operations. High-quality data and the insights it provides are the ultimate sources of competitive advantage in the digital age; yet, extracting this business value requires an enormous amount of compute power. Unless we crack the code on delivering greater compute power with less energy, the IT sector could consume one-fifth of the world’s electricity and produce up to 5.5% of the world’s carbon emissions by 2025. We must develop technologies for the future with sustainability in mind—which is why HPE is committed to improving the energy performance of our product portfolio 30 times by 2025. But we can’t stop there. We need to consider entirely new approaches to compute architecture and consumption models, while at the same time enhancing the trust, security, and governance capabilities of our customers. 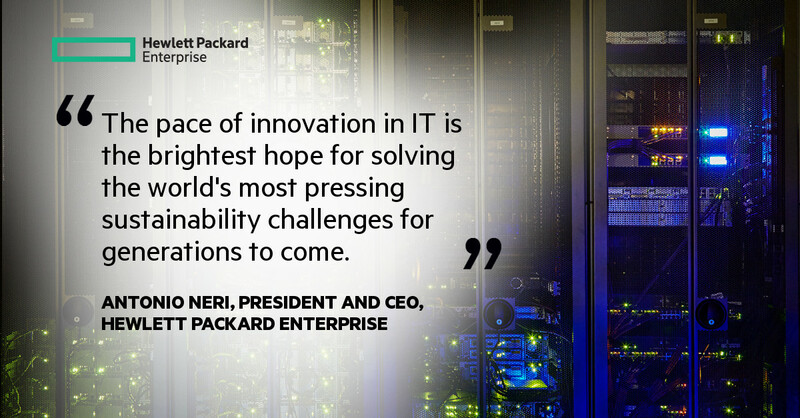 Although HPE is at the forefront of rapid innovation, we haven’t forgotten the values that define us. The technology sector should remember that innovation has always been confronted with ethical choices. We are proud to remain a responsible partner for our customers—to be a company that invests in its employees and sets high standards for its supply chain. Environmental and social governance issues are rising to the top of boardroom agendas around the world as investors, customers, and regulators increasingly take note. Climate and human rights risks have the potential to affect every part of our value chain, including setbacks from materials scarcity and supply chain disruptions. Maintaining a resilient business means being proactive in addressing these risks before they affect customers and communities. Our commitment to sustainability is increasingly important to our future as we work nonstop to shape our customers’ businesses and generate value for our shareholders. As a global company with customers around the world, our leading sustainability practices position us to have a foot forward in any market. I’m incredibly excited to guide HPE through this business revolution, empowering customers, benefiting humanity, and energizing our business. Find out more about HPE's sustainability initiatives in the new Living Progress Report.